What makes a great vacuum for pet hair on stairs? Which Vacuum is Best for Your Home? If you have stairs in your home, you know how annoying they can be to clean. Stairs and banisters accumulate dust and fur balls like nobody’s business, and offer lots of nooks and crannies for messes to hide! Stairs pose a challenge to the maneuverability of any vacuum, whether upright, canister, or stick design. You want one that’s light, ergonomic, and adaptable to any awkward staircase. Plus, you’ll need plenty of attachments to tackle the job. How do you know which ones will actually make your stairs less of a pain to clean? We’ve done the research to find out! We looked for features that we love for cleaning stairways, both carpeted and hardwood. We compared dozens of models from the leading brands, and narrowed down the field to 3 top winners which we think will make vacuuming your stairs simple and easy. You can read our full reviews of each pick below. We’ll take you through their important features, and talk you through how each one handles stairs. After our reviews, you’ll find our guide on how to shop for the best vacuum for stairs. 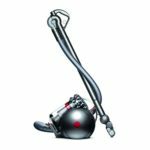 Dyson Big Ball Multi Floor: the most popular! Dyson V8 Absolute: for the ultimate in flexibility! Miele C2 Electro+: for people who want the best of the best! This updated version of Dyson’s best-selling canister is a powerful, smart solution for vacuuming pretty much anywhere around your house. Its excellent maneuverability, small footprint and deluxe attachment set make it one of our favorites for vacuuming stairs. We used to recommend the super-popular DC-39 canister in this slot, but the Big Ball Multi Floor is a huge step forward, so we think it’s worth the increase in price! We should also note that the Cinetic series is actually more recent. However, since we’ve found that the Cinetic filtration system doesn’t work nearly as well as advertised, the Big Ball Multi Floor is still the best Dyson canister available today. Between the power cord and attachment hose, the Big Ball Multi Floor has slightly more than a 32-foot reach. That should be more than enough to let you maneuver through a stairwell, even if you don’t have outlets midway. The main floor attachment on this model is a Trigger-head combo tool. It works on hard floors as well as carpets, adjusting between them automatically! The Trigger tool uses an air-powered beater brush for working on carpets and rugs. You can turn it on and off from the handle, as you change between flooring types. It’s surprisingly effective for an air-driven tool. We especially like the narrow design of the Trigger-head for working on stairs. It can fit on most steps with ease, allowing you to cover more ground than you’d be able to clean with an attachment head. There are two more attachments we love for working on stairs. The first is a turbine head. It’s powered by suction, just like the Trigger-head. The two opposing brushes scrub stuck-on pet fur off of furniture upholstery and is ideal for plush, carpeted stairs. Since there’s no beater bar, there’s nothing for hair to get tangled in. It’s one of very few so-called “tangle-free” tools that actually lives up to its name. The second great attachment is a dedicated tool just for cleaning stairs. It works on smooth stairs or low-pile carpeted stairs. It has velour strips to lift carpet pile, and grab pet hair. The attachment also has air flow holes which keep the tool from sticking straight onto your carpeted stairs. The Big Ball Multi Floor is a canister design that works on a central ball design. The canister steers on the ball, and the ball is also the dust chamber. Central steering makes the Big Ball extremely maneuverable on staircase landings. Plus, you don’t have to worry about it tipping over like other models. Usually, one tipping over isn’t the end of the world. On stairs, though, it can be dangerous and cause damage. Not only is this less prone to tipping, but it self-rights! If it goes to one side, it stands itself back up again! Since the Multi Floor’s ball design is more compact than other canisters, it can rest on stairs or landings much more easily than other models. It’s called a Big Ball, but compared to bulky offerings from many competitors, it’s still quite small. The special suction system inside the ball uses a cyclone effect. Dyson claims that this eliminates suction loss from debris accumulation on filters in traditional air systems. You shouldn’t have any trouble with suction loss. Plus, there’s no bag or filter to replace. The dust chamber gives you about 1/2 a gallon worth of dirt storage. That’s a lot more than you’ll have with the bagged competition. We also love that the cyclonic action packs pet hair right to the sides of the canister. That makes the compartment a lot easier to empty! With Shark’s and other bagless models, the fur tends to cling right to the filters and make disposal a pain. The closed air system also provides HEPA filtration for your air. It’s also acoustically sealed for reduced noise levels. We already mentioned that this isn’t actually the most recent Dyson canister in the lineup. We think the Multi Floor far outperforms the newer Cinetic systems. Not only is it a better vac, but you can save a nice chunk of change by opting for this older model! It’s covered by a 5-year warranty on parts and labor. It’s not ideal for mid-to-deep pile carpets. The beater bar is air powered, which won’t cut it on wall-to-wall carpet that has any sort of pile. Plus, the head is smaller and narrower than most. That means you’ll have to spend more time and effort on your carpet. We always recommend going with one that has a motorized brush head for serious carpets. Check out the Miele C2 Electro+ for that purpose! While there aren’t any problems with suction due to filter blockages, larger debris occasionally gets stuck at the joint between the hose and the canister. It’s not a huge issue, but something you don’t encounter with Miele’s. It doesn’t store conveniently. The wand and hose hang separately from the canister, so you’ll have to pile the whole thing into the corner of a closet to get it to stay in one place! 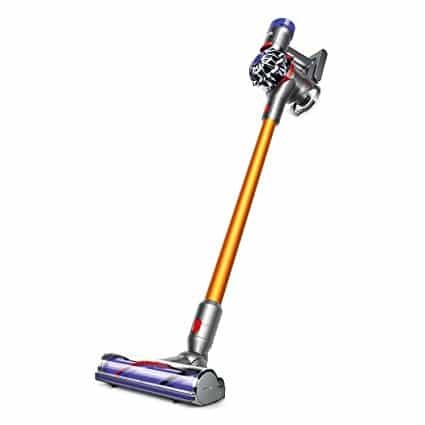 Our most flexible recommendation for vacuuming stairs is this Dyson ultralight stick model. The V8 Absolute is a very adaptable stick model that’s equipped to clean stairwells from floor to ceiling. 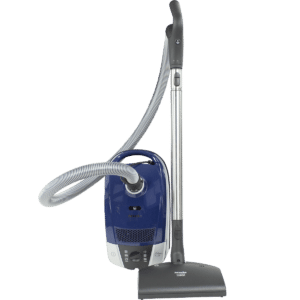 We love that it combines the flexibility and versatility of a cordless stick vacuum with the kind of suction you’d normally expect from a full-size machine! The V8 Absolute is the first cordless model we’ve found practical for whole-house cleaning, and it’s ideal for those with lots of stairs in their home! It’s the longest-running cordless vacuum on the market! The Dyson V-series have long been our favorite cordless options, but we’ve never been able to recommend them for whole-home cleaners because of their short battery life. With a runtime of up to 40 minutes, the V8 Absolute finally changes that! This one gives you enough juice to get through most living spaces in one go. If you have a larger home, you may need to clean in chunks. However, the big point is that this is the first cordless vac we’ve come across that’s actually practical! The benefits of going cordless on stairs should be pretty obvious. Especially if you have longer staircases or more than one flight to clean, you’ll no doubt run out of cord with a traditional vacuum. The V8 can operate anywhere, regardless of where your outlets are placed. This thing also gives you as much range as any canister model! You can easily remove the floor head to clean above you in high places. Cleaning anywhere is easy, and you don’t have to think about where the main unit will be balanced–a key annoyance with full-size models. It couldn’t be more ergonomic! The V8 is under 6 pounds all told, and the weight is very balanced across the design. Our favorite thing is that you can adjust the length of the wand. That lets you use the floor head at a shorter distance, so you can easily clean steps in front of you as you climb. That’s tricky with full-size vac’s. The V8 essentially turns into a handheld vac with a full floor head! It has not one but two motorized brush heads! The first has a direct-drive system which gives you 150% more brush power than most other brush heads on the market. It’s equipped with stiff bristles to work right into carpet fibers. We think it’s ideal for carpeted stairs–especially when you have pet hair to deal with! The second is a traditional brush head with softer bristles for safe cleaning on hardwoods and tiles. It has a slightly larger mouth as well, so it’s perfect for larger debris like kibble or litter. The V8 Absolute also has plenty of other attachments to help you out! There’s a smaller motor brush for scrubbing pet hair and dirt off vertical carpet surfaces. This one’s our favorite tool for cleaning cars, too. You’ll also find that it’s simply ideal for pet beds! Finally, you get a soft dusting brush and crevice wand to complete the set. Whichever cleaning mode or attachment you use, the Dyson V8 Absolute packs a heck of a lot of suction! In fact, it can compete with all but the best full-size models in terms of sheer power. That’s thanks to the cyclonic suction technology it shares with Dyson’s larger offerings. There’s also a MAX mode, which allows you to crank up the suction even higher! With MAX mode engaged, the V8 actually surpasses a lot of full-size vacuums in the power department. It doesn’t give you nearly as much cleaning time with this mode engaged, though. It’s one of very few stick models to feature full HEPA filtration! The V8 keeps fine pet allergens securely inside the dust compartment. The compartment empties easily over the trash with one button release. The V8 Absolute’s trigger system allows you to conserve energy and only use juice when you need it. We’ve found that every minute really does count when you’re using cordless models, so it’s a nice upgrade over the competition. It’s much more reliable than other convertible stick models such as Shark’s. That’s one reason Dyson earned the highest user satisfaction scores in a 2018 JD Power survey. It’s also a key reason why this specific model has been rated the best stick vac by a long shot in Consumer Reports! It comes with a charging port that doubles as a hanger. It’s very expensive.You’ll pay as much for one of these as you would for a full-size Miele canister. It’s actually the priciest Dyson on the market. The attachments don’t store onboard. You’ll probably want to keep the vacuum and the attachments in a crate for easier storage. The dust cup is relatively small. That means if you’re going to clean your whole house with this vacuum, you’ll probably have to empty the dust cup a few times per session. This is especially true for pet hair. It’s quite loud. That’s not surprising for a lightweight stick vacuum, since they’re all pretty whiny. The noise isn’t a dealbreaker for us, but you might find it annoying. The C2 series is Miele’s compact canister grouping. These canisters have a smaller footprint than the C1 or C3 vacuums, but don’t skimp on the power! We love the C2 because the smaller canister will fit on a step or landing much more easily than one of the other series. We’re recommending this Complete set as our top quality choice for vacuuming stairs, thanks to its high-end construction materials and fully adjustable motor settings. It’s an absolute gem on both carpeted and hardwood floors. It also does a great job capturing and containing pet hair/dander. It looks great. The deep blue finish and sleek, compact design are so much more aesthetically pleasing than other, more utilitarian designs. There are fewer parts that stick out, which also means fewer parts to break. Plus, it doesn’t have the cheap, plasticky look of other models from the leading U.S. brands. We also love the rubber bumper on the edges of the C2 series. It protects your molding and wood trim as you vacuum along walls and, of course, stairs. The 33-foot operating radius is the largest of our corded recommendations for stair cleaning. It’s ideal for cleaning longer staircases where outlets are in short supply. The motorized carpet brush head works better than comparable features on other brands’ vacuums (such as the Dyson). It has wider coverage, and an easy access port for de-tangling. It’ll do a great job on any kind of rug or carpeting. This makes the Miele a good choice for people with a variety of flooring types. This edition of the C2 also includes Miele’s new parquet attachment. It’s a hard floor head with a swivel joint and soft natural bristles for cleaning your delicate wood surfaces with care. It’s perfect for your wood stairs, as well as wood molding. We especially like it for steps since it’s nice and shallow. This is a very ergonomic vac. From the swivel joints to the balance on the wand, it’s all very well-designed. You can control the power button and cord retraction with foot switches. The cord also retracts automatically for storage. It’s ideal for cleaning pet hair. The parquet attachment has gaps to let hair into the bristles, rather than pushing clumps around. The bags are a lot more generous than you’d expect for such a compact canister, too. They even self-seal when you swap them out, so none of the hair and dander escapes! The German build quality trumps other models in this price range. While the Miele is only slightly more expensive than the Dyson, it uses much more metal and higher-density plastic. It’s a tank of a machine. As you’d expect, Miele also has a vastly superior reputation for durability when compared with Dyson. Their models come with a 7-year warranty on the motor and casing, and 1 year on all other parts. This is the most expensive vacuum we recommend in this category. It costs more than either Dyson, and it’s only beat by the more premium Miele canisters. However, we think the rugged build quality and excellent reliability record make it worth the extra cost. The motorized carpet head does an excellent job, but it’s not as easy to fit on each step as the Dyson. The flip side is that you can cover more ground faster on full-room carpeting. It’s the best canister vacuum on the market in terms of power, versatility and portability, but it’s still not quite as convenient to use on stairs as the cordless V8. Still, it’s the best full-size option for this category. lots of room for captured fur! When you’re shopping for your new vacuum, make sure you take your flooring material into account. Hardwood stairs require a vacuum with soft bristles, that will protect the finish on the stairs as you vacuum. Carpeted stairs require a vacuum with either a smaller powered brush head, or a secondary brush attachment to scrub hair out of carpet fibers. We particularly like these smaller, powered hand brushes for vacuuming vertical carpets on the kick plates of your stairs. Most vacuums will provide cleaning range in terms of radius. This number combines the length of the power cord and the attachment hose on a given vacuum. For stairs, we recommend a vacuum with no less than 20 feet of cleaning radius. That means you’ll probably want a canister or stick vacuum. While upright vacuums can handle short flights of stairs, they generally have shorter attachment hoses of 10-12 feet. That’s not really enough to clean all the way up the average flight of stairs. We also warn against uprights because of their ergonomics. Upright vacuums are heavier, bulkier, and much less maneuverable in a stairwell situation. If you’re all about flexibility and maneuverability, we recommend going for the Dyson V8 Absolute. It’s a lightweight, versatile vacuum that can handle all types of stairwell cleaning, both on the ground and on the ceiling. With plenty of cordless power, it’s also perfectly capable of cleaning the rest of your house. We think this is by far the best cordless vac on the market these days. It’s suitable for both carpeted and hard stairways. However, it does lack some of the ruggedness and durability of our other choices. And any cordless vacuum does limit your cleaning time. For something with a bit more power and a much bigger dust chamber, we recommend going with the Dyson Cinetic Big Ball. It has slightly higher suction than the V8, thanks to its massive radial cyclone system. The Dyson also has a much bigger dust chamber, so you can vacuum all over your house without emptying the canister. However, it can’t handle deep carpets very well. It’s also made with a heck of a lot of plastic given the exorbitant price. The Miele C2 Electro+ offers markedly better build quality than the Dyson’s, for only a slightly higher price. Its metal parts and heavy plastic feel much more reassuring as you’re cleaning. The other major advantage is that the Miele offers adjustable suction. While the Dyson’s are all raw power, the Miele is more refined, and allows you to cater the vacuum’s suction to each surface. Overall, we’re impressed by the smart, compact design, which is maneuverable in the tightest stairwells. The Miele’s rubber wheels and bumpers make it a much safer choice than either Dyson for vacuuming hardwood stairs and around molding. Plus, it’s the best of the bunch for removing pet hair from carpet. If you can afford it, you’ll be extremely pleased with the C2! We hope you’ve got a better sense of how to find a vacuum that will make cleaning your stairs quicker and easier. If you’re still not confident that you’ve found your ideal vacuum, you can read more from our Best Vacuums for Pet Hair! We also suggest taking a look at Amazon’s top-selling vacuums here! You can compare prices, features, and see what buyers are saying about how these best-sellers perform on their stairs.